Hello my lovelies and welcome to another kawaii unboxing! I hope you are having an adorable almost-spring day! I have one of my favorite posts prepared for you and I'm so happy to share with you that today we will be unboxing brand new Kawaii box together! If you want to see the goodies close up, I have a video prepared for you as well. 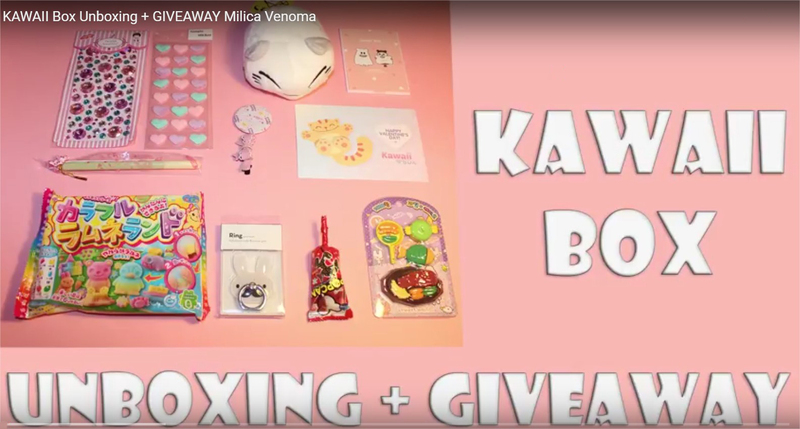 As you might already know, Kawaii box is one of the cutest subscription boxes out there. It's full with 10-12 handpicked kawaii items that arrive straight to your doorstep every month! The box for January that I received recently was packed with 11 super cute items that all arrived in a white-pink box to my doorstep with no additional taxes. That is one of my favorite things about Kawaii box - I never know what I will get in it but I'm pretty sure I will love it as well as tax free treatment in my country for boxes of this size. Now let's move on to what goodies were inside the Kawaii box! Let's start with one of the most practical items in the box was Ghost Pop Pocket Mirror - it's pink and super convenient for carrying around in your bag. Also the stickers section did not disappoint. I got a brand new set of adorable small hearts in Valentine's Plush Stickes and I genuinely enjoy them. They added some bling with Twinkle Deco Jewels as well! Cutest small little things were Harajuku badge and Cute ribbon hair clip. I know just a little girl who is going to be crazy about these! Adorable yummy Korean Meal Eraser Set and Pocky Stick Ballpoint Pen is also going to a schoolgirl who I bet will have a lot of fun with it. I love that in many kawaii boxes you can find a DIY which this time was Kracie Poppin' Cookin' Colorful Ramune Land DIY kit. Soon as I rarely manage to do a DIY by myself, it bring me closer to my friends and family. It's a lot of fun and I get to share the experience with others. My personal favorite was the plush (I am a sucker for plushies!) called Nemuneko that looks like an adorable white/pink kitten! I just love that one!